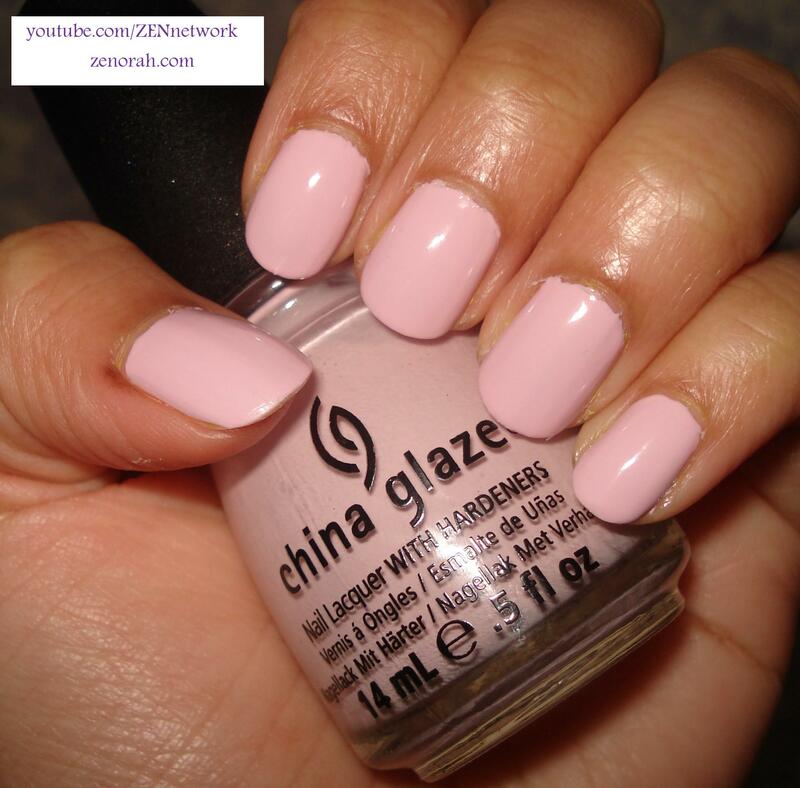 China Glaze Something Sweet – is a pale pastel pink with a very slight hint of purple creme polish. This polish was released in China Glaze’s Spring 2010 Up & Away Collection – and this is confession time – I bought the ENTIRE collection (my sister took Sugar High so i don’t have that one anymore but the nail polish addict that I am might repurchase it, not only because I really did like that pink but because I need to have ALL of them lol). This is probably the strongest Spring collection I have ever seen released by any nail polish company – it was such a strong collection the folks over at China Glaze Headquarters re-promoted it this year in stores (saw them at my local beauty supply store) but avoided a press release because I am certain they didn’t want to take away ALL the attention from their Electropop Collection. Am I the only one who thought Electropop was their attempt at making another Up & Away hit? To me it didn’t work – like the old saying goes, if it ain’t broke don’t fix it. So I think it was smart of them to re-promote the Up & Away Collection – I think they should have made that entire collection as part of their regular line up – it’s just that good! Alright, that’s my rant of the day lol – getting back to THIS polish – I am not the biggest fan of pastel pink nail polishes on my skin tone, to be honest the only one I do like is Essie Fiji (which i will save for another upcoming post) but for the most part this was a sleeper hit for me. It was decent in application but like EVERY pastel shade it was streaky on the first coat – what you are seeing is three coats of polish but it did dry well in between coats and the polish leveled itself out without any bubbles etc. It had a slight shiny finish but due to the three coats of polish – the next day I had dents and keyboard marks on it from typing so needless to say, this manicure lasted only ONE day before all hell broke loose on it. All that being said, I really do like the colour A LOT and I think next time I will try it with a more thicker second coat to avoid wearing three coats because I do believe it might make a difference in wear time. For all my nail polish junkies that LOVE a good pastel pink she is your baby and very affordable as well. I have heard it is similar to OPI Mod About You and Butter London Teddy Girl, which are polishes I DO NOT own so I wouldn’t be able to tell you if it’s a true dupe or not but it’s a good formula, gorgeous colour and affordable. Do you own China Glaze Something Sweet? What are your thoughts on this nail polish? How does this compare to Essie Fiji? I love fiji color but hate the application and dry time! It didn’t pass the boyfriend test and I’m not sure why. I wonder if it’s jst not right for my skin. I am a tad darker than you I believe. I was considering something sweet bc it looks to have a bit more color than Fiji which may look nice on me. I also own Opi pink Friday and find it to be a bit too Barbie pink as opposed to baby pink. What at your thoughts? Hey Taryn, Essie Fiji has more white in it than CG Something Sweet – I found Something sweet as honestly the best pastel pink I have tried. I consider Fiji more a white base with hints of pink if that makes any sense. I think this would actually look amazing on your skin tone. The only reason i don’t wear it often is strictly because I am not a huge pastel pink nail polish lover. I bought this one for my sister who is a little darker in skin than I am and she has almost finished her bottle!